We just wanted to share with you a change in the timing of our school day that we will be implementing starting December 3, 2018. The change in the rhythm of the day does not impact parents directly, as our start time, end time and lunch time remain the same. The change in the daily schedule will be noticed by our students, as we change the rhythm of the day to improve learning for them. The questions you may have, would be, why change and why at this time of the year. Why change? As you are aware, Alpenglow School continues its close working relationship with the Calgary Waldorf School with our teachers currently receiving mentorship from Larry Glatt (Pedagogical Co-Administrator at the Calgary Waldorf School) and with our teachers also visiting classrooms and working with staff at the Calgary Waldorf School. The intended outcome of this relationship is for our teachers and school to be reflective of our practice as we deepen our understanding of how a Waldorf pedagogy improves learning for our students. One observation was the rhythm of our learning day was slightly different than the rhythm we had observed in the Calgary Waldorf School. In short, it was felt that by reorganizing our morning, the main learning blocks would align better for our students’ learning. Students will start the day by moving directly into their first main learning block. The movement of snack time earlier in the morning better meets the needs of our students by keeping them fueled as they reach mid-morning. Moving the morning walk allows time for our students to process the learning of the first main learning block before moving into the second main learning block of the day. Why now? This change to the rhythm of the learning day has come out of the work our teachers have been doing this fall with the staff from the Calgary Waldorf School. Staff have taken time to be reflective of our practice and be purposeful in how to implement the changes in a manner that improves student learning. We also have taken the time to share our thoughts and discuss these proposed changes with our Alpenglow Parent Council to get their feedback and suggestions on how to best move forward. We feel this change aligns well with our Mission Statement: “To connect our children with themselves, nature and community through an integrated nature-based approach to learning drawing on Waldorf pedagogy.” The change also aligns well with the change in season, as we approach the winter solstice, the timing for change in the rhythm of our day feels natural. 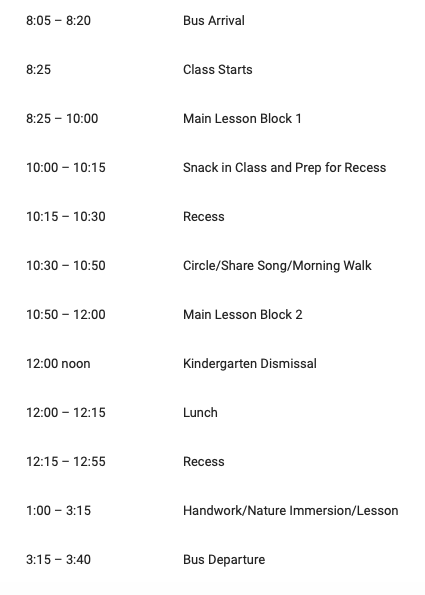 We have included the change in the schedule for you to look at and we will post this in our updated Handbook on the school website. Please feel free to contact Hans or myself if you have any questions. The Alpenglow Kindergarten program is Monday - Thursday from 8:25 am - 12:00 pm. There is no Kindergarten class on Fridays. The Alpenglow Grades 1-6 program is Monday – Friday. Classes Monday-Thursday are 8:25 am - 3:15 pm, and on Fridays 8:25 am – 12:15 pm. Friday classes end at 11:45 am on Teacher Professional Learning Fridays. Please see the CRPS Learning Calendar for exact days. The bell rings at 8:25 am. The Alpenglow School children will begin their day together outside by their entrance.